Divine technique is an effective medium that bridges the gap between life and God. When we know the art to access the right technique for the right purpose, then there is only a successful journey to life. To keep up with the pace of time we have a right spiritual technique! There is a secret lock in our lives but the unseen master holds the key to it. He is the Kala Bhairava, the one who controls the time schedule. Just worship Him and see how well one can be gifted with the skill to control time. This Homa inculcate positive vibrations that increase the productivity and it also guide one towards the path of success. 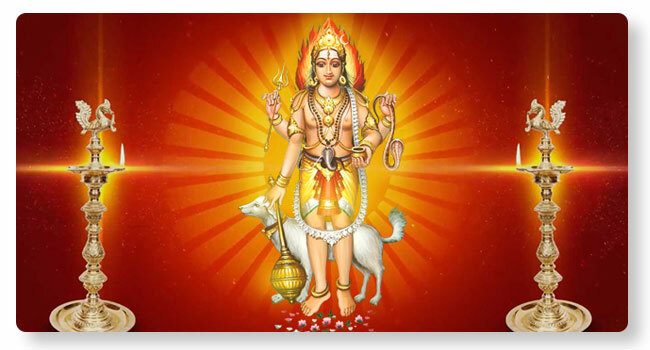 Lord Kala Bhairava, the manifestation of Lord Shiva is the chief deity of this Homa. He is twirled with serpents all around his body and his vehicle is the dog. What does one get from this Homa? The answer is that one gets a sense of time, value of time and keeping punctuality. Even a super intelligent personality comes into lime light only if he has the skill for time management. It seems to be an independent and logical technique to be applied in our lives, but it needs a divine push for its complete execution. Worshipping the Lord of time is to understand the secrecy and importance of time. He gives indication to avoid unwanted happenings and saves one from it. To put in other words this god inculcate such vibration that one can make use of best opportunity in life at the right time. One will be blessed with the capacity to work ahead of time, he relieves us from debts, pave way for contented income, improve financial status and makes us live with respect. It is best recommended on the 8th waning moon or Krishna Paksham.